Posted on March 15, 2017 March 15, 2017 , in Swim Spas. Although swimming pools are still in high demand among consumers, the modern swim spa is quickly becoming a popular choice because it provides many of the benefits of a swimming pool while offering added versatility. Below, you’ll learn about the wide range of benefits swim spas provide and why their demand is growing at such a rapid pace. Swimming pools are great places for fun in the sun, but many people who want to install one find that they don’t have enough space. For those who have small back yards, swim spas are an ideal choice because they can fit almost anywhere. 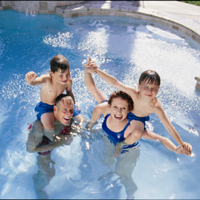 Some swim spas are only slightly larger than a hot tub and provide many benefits of a swimming pool. Because of this, consumers then have additional space to install decks, patios, and other outdoor features. Another perk is that by installing an above ground swim spa, you’ll be able to easily transport it to a new location if you move. Swimming pools cost $50,000 or more to install, making it difficult for many people to afford. Swim spas are a more budget-friendly option, with a price tag of as little as $22,000. Swim spas can also be installed quickly, in a few days as opposed to the several weeks it takes to put in a swimming pool. It also costs substantially less to heat and chemically treat a swim spa than a swimming pool. While you can only use an outdoor pool for a few months of the year, you can use a swim spa year-round, allowing you to stick to your fitness routine and have a place to relax and stay warm during the winter months. This is a major plus for most buyers as it offers more use for your money than a pool. While many people assume that swimming in a swim spa and a swimming pool offer the same workout, the workouts are actually quite different. The best swim spas allow you to adjust your speed and increase your resistance, challenging yourself as your ability level improves. In addition, accessories like rowing features and tether cords can be added to your swim spa, allowing you more versatile options for exercise. While many people install a swimming pool and then add a hot tub later, this can be quite expensive. With a swim spa, you can choose a model with a heated massage area so you can adjust the temperature in different areas and enjoy a relaxing jet massage. Some models also offer jet structures that allow you to target your massage to specific areas of your body. Now that you know more about the rising popularity of swim spas, download our buyer’s guide and find the right swim spa for your lifestyle.